Gatumbaite: Mineral information, data and localities. Named for the type locality in the Gatumba District, Rwanda. 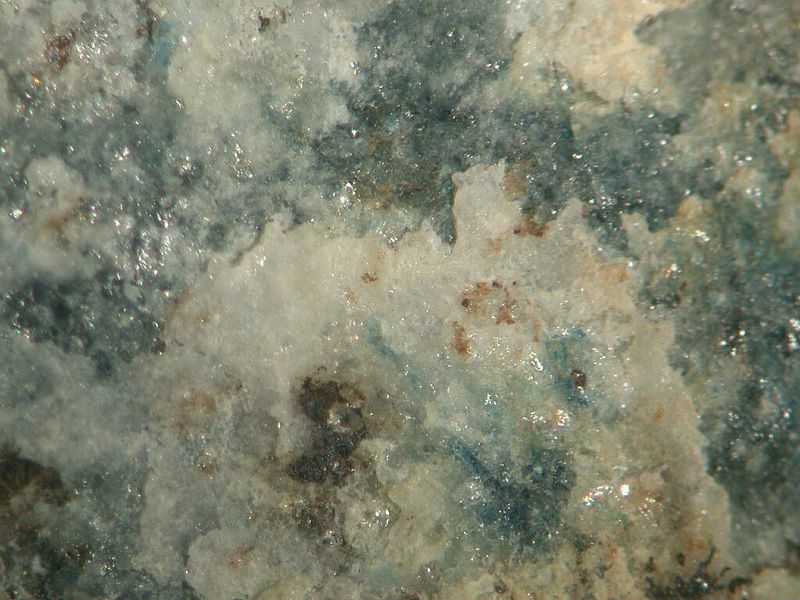 This page provides mineralogical data about Gatumbaite. Buranga pegmatite, Gatumba, Ngororero District, Western Province, Rwanda von Knorring, O. and Fransolet, A.-M. (1977) Gatumbaite, CaAl2(PO4)2(OH)2.H2O: a new species from Buranga pegmatite, Rwanda. 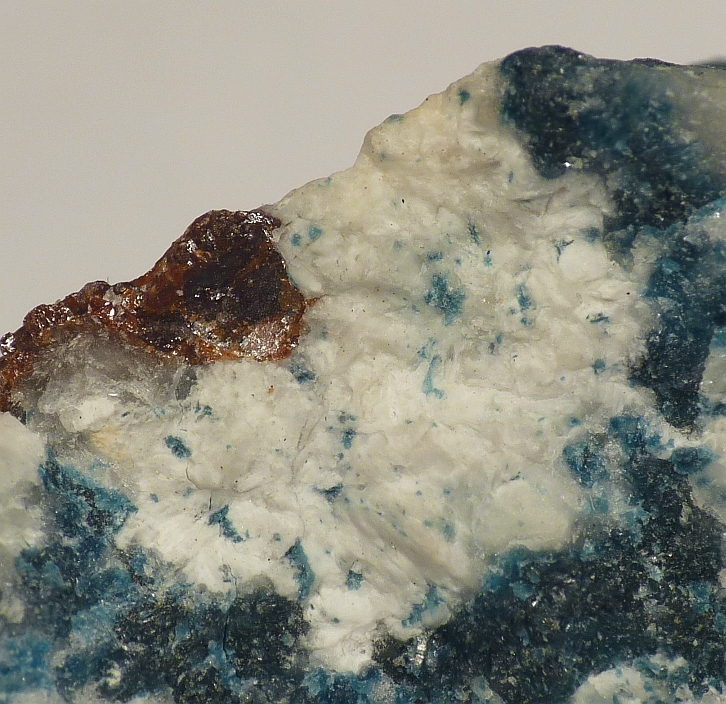 Neues Jahrbuch für Mineralogie, Monatshefte: 12: 561-568.
white millimetric sheaves and rosettes with trolleite, scorzalite, apatite, and bjarebyite. Scorzalite 3 photos of Gatumbaite associated with Scorzalite on mindat.org. 8.DJ.30 Wycheproofite NaAlZr(PO4)2(OH) · H2O Tric. 42.11.12.2 Kleemanite ZnAl2(PO4)2(OH)2 · 3H2O Mon. von Knorring, O. (1972) Notes on phosphate minerals from Buranga pegmatite. 16th annual Report res. Inst. afr. Geol., Univ. Leeds, 56-57 (as unnamed Ca-Fe phosphate phase). von Knorring, O. and Fransolet, A.-M. (1977) Gatumbaite, CaAl2(PO4)2(OH)2.H2O: a new species from Buranga pegmatite, Rwanda. Neues Jahrbuch für Mineralogie, Monatshefte: 12: 561-568; American Mineralogist: 63: 793-794 (abstract). Duggan, M.B., et al. (1990) Phosphate minerals in altered andesite from Mount Perry, Queensland, Australia. Canadian Mineralogist: 28: 125-131.
ⓘ Hinomaru-Nako mine (Hinomaru-Nago mine) ? von Knorring, O. (1972) Notes on phosphate minerals from Buranga pegmatite. 16th annual Report res. Inst. afr. Geol., Univ. Leeds, 56-57 (as unnamed Ca-Fe phosphate phase). ; von Knorring, O. and Fransolet, A.-M. (1977) Gatumbaite, CaAl2(PO4)2(OH)2.H2O: a new species from Buranga pegmatite, Rwanda. Neues Jahrbuch für Mineralogie, Monatshefte: 12: 561-568.; Daltry, V.D.C. and von Knorring, O. (1998) Type-mineralogy of Rwanda with particular reference to the Buranga pegmatite. Geologica Belgica: 1: 9-15.; HB4 (2000). Ek, R. and Nysten, P.E. (1990) Phosphate mineralogy of the Hålsjöberg and Hökensås kyanite deposits. Geologiska Föreningens I Stockholm. Förhandlingar, Stockholm: 112: 9-18.; Daltry, V.D.C. and von Knorring, O. (1998) Type-mineralogy of Rwanda with particular reference to the Buranga pegmatite. Geologica Belgica: 1: 9-15 (referring to Ek and Nysten, 1990). Segeler, C.G., Ulrich, W., Kampf, A.R., and Whitmore, R.W. (1981) Phosphate minerals of the Palermo No. 1 Pegmatite. Rocks & Minerals: 56: 196-214.; Peacor, D.R., Dunn, P.J., Roberts, W.L., Campbell, T.J., and Simmons, W.B. (1984) Sinkankasite, a new phosphate from the Barker pegmatite, South Dakota. American Mineralogist: 69: 380-382. Daltry, V.D.C. and von Knorring, O. (1998) Type-mineralogy of Rwanda with particular reference to the Buranga pegmatite. Geologica Belgica: 1: 9-15. (referring to Segeler et al., 1981).